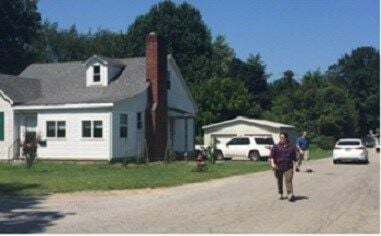 BARDSTOWN, Ky. (WDRB) -- Kentucky State Police searched a home in Bardstown on Tuesday morning that belongs to the grandmother of Brooks Houck. Trooper Jeff Gregory confirmed the search warrant for a property on Pulliam Avenue. Neighbors said police pulled up to the home of Anna Whiteside about 10 a.m. Troopers were seen removing five bags of evidence from the house and then leaving in a white SUV. Whiteside's attorney, Jason Floyd, said it's his understanding that the troopers were searching for items related to bullets and a reloader, but he was waiting to get a copy of the search warrant. Floyd believes they removed a reloader from the home. He said this was the fourth or fifth time police have searched the home, but he said no property has been returned and he hasn't received any information about testing on anything removed from the home. Houck is the former boyfriend of Crystal Rogers, who disappeared two years ago. He is the only suspect named in her disappearance and is believed to be the last person to see her alive. He has not been charged. The 35-year-old mother of five disappeared July 3, 2015. Her car was then found abandoned along the side of the Bluegrass Parkway two days later. Tragedy struck again for Rogers' family in November 2016, when her father Tommy Ballard was shot and killed while hunting on family property. KSP considers the incident a death investigation. Members of Rogers' family came to watch the search of the home Monday, including Tommy' Ballard's father, Till Ballard, who said it's hard to wait for answers, but he has faith KSP will find whoever took the lives of his son and granddaughter. "Whoever killed them, they're walking around just like 'I done it and ain't nothing you can do about it, nothing the law can do about it.' They're going to get a surprise one of these days," Till Ballard said. The Ballard family said new leads continue to come in, and KSP is investigating. Rogers' mother, Sherry Ballard, encourages people to tell what they know. "Don't be scared to come forward," she said. "It could mean finding my daughter, or it could mean putting the person who did this to them behind bars." It's still not clear which case the search might be connected to. Brooks Houck has been the only suspect named in Rogers' case, but he was never arrested. His brother, Nick Houck, was fired from the Bardstown Police Department during the investigation of her disappearance. When asked, KSP could not confirm which case the search warrant pertained to.